I have two questions. First, has anyone here ever made a Lucy Boston Quilt, and if so can you post a picture? And second, would any of you happen to know what the yardage would be for the backing of a x-large queen size pieced quilt? Other than block patterns, I can't seem to be able to find any info. about this quilt pattern. Thank you in advance for any help you're willing to offer. I have been working on blocks off & on for a while. As I find another fabric to try a block. It’s fun and one day will be a whole quilt. The individual blocks are terrific. As for backing for an extra large queen....???? It would depend on the size of the top — how big is extra large queen? I thought I had a few pictures of blocks but only found this one ( in the works ) block. The others must be on my phone. Anyway, I’m finding it fun to find just the right piece of fabric, and playing with combinations. 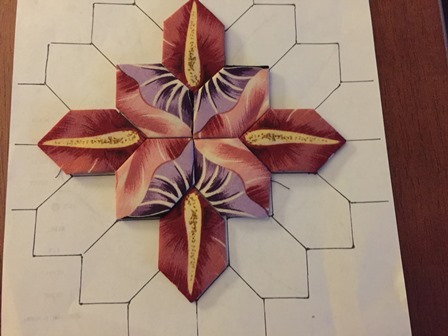 My friend works intermittently on her Lucy Boston Quilt and I just wish I could post pictures for her since she doesn't have a computer (probably a good thing because shopping online for fabric might prove to be too much of a temptation for her, LOL!) Anyway, I knows she's planning on finding the biggest backing available and she has a fantastic longarmer. Here are some pictures of ones in progress. I use a template to lay my pieces out on to get an idea of the finished product. In one of the pictures there are three different color pieces that I'm auditioning to see which one I like best. I found having the template to lay them on really helps me visualize how it will be in the end. I'm a long way from a quilt however I did use Lucy Boston squares to make the end of a sewing machine cover. I have more squares and lots of potential fabric but these are the only pictures I have handy. Wow. This is what I am planning on working on while I visit my parents this summer. Thank you for the pictures and the idea of the layout tryouts. Wow!!! I've never heard of that quilt but those blocks are georgeous!!! Hope you ladies plan on posting pics on the finished product....!!!!! 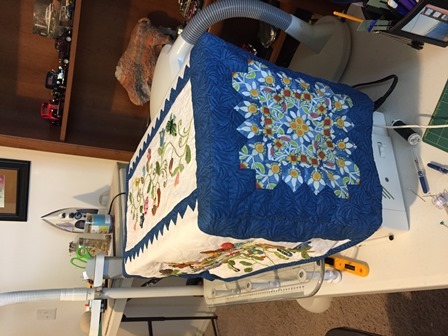 I have been privileged to have citruscountyquilter introduce me to this and help me. I love the way she uses color and elements of fabric in her designs. Many thanks!! Connecting threads has an acrylic template of the honeycomb shape that you can purchase. This is an amazing quilt - I had never heard of it but it looks like a lot of fun to do. I am working on The Insanity Quilt by Rhonda Pearce and when I finish it, I will have to start this one. I love all of the blocks so far. I would love to make one, but never will because I hate hand sewing. you know you can do the project by machine using invisible thread and tiny blind hem stitch......saw on Craftsy, she dud hexies, but same technigue can be used on POTC. This is beautiful. So, am I to understand that this is hand-pieced like the hexagon ones. 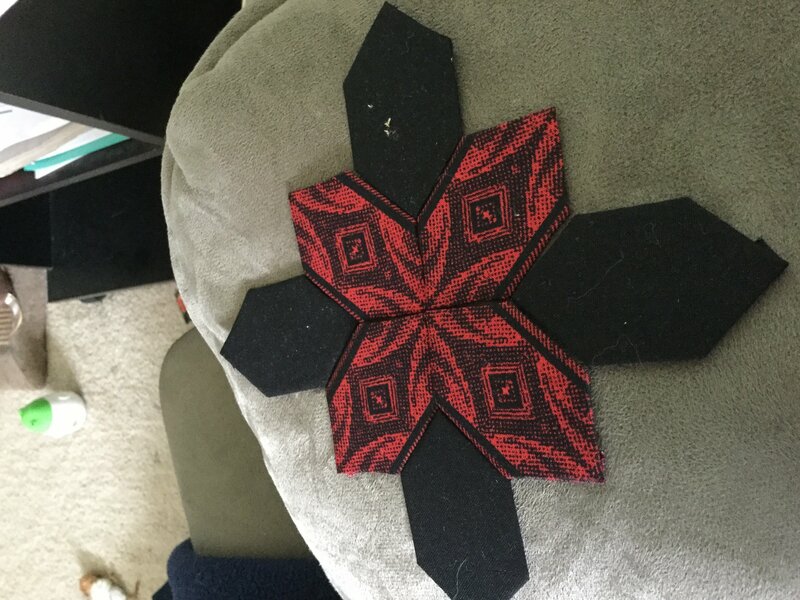 I know that you can to the hexagon ones by machine, but I do mine by hand, as a time filler when I have to wait at doctor's offices or watching TV or visiting friends when you don't have a sewing machine. These would be a nice change from the hexagons. 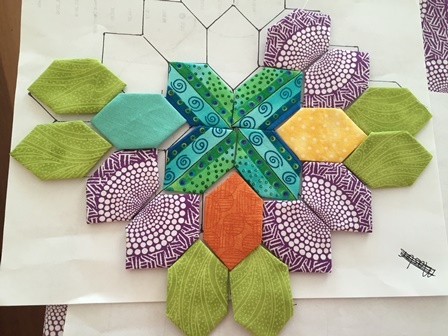 By the way, Craftsy has a great class on paper piecing hexagons and other shapes. It is really a helpful class and the teacher is fantastic and shows the work clearly and explains the technique perfectly. Thank you ladies for your help and your photos.....your blocks are beautiful. Can't wait to see the finished products. I made a mistake when I posted my questions though....I didn't mean to ask for yardage for the backing of the quilt, what I meant was how much fabric would I need for the BACKGROUND of each block. In other words, the long hexie path that finishes each block. I'm thinking that my quilt will measure approx. 96"x106" or so. Sorry for the confusion. And once again, thanks in advance for your help. I have never made a POTC or Lucy Boston whole quilt. I have made several blocks that were inspired by this for block swaps. I have appliqued them to a 12.5 inch square of fabric as stand alone blocks. A few I had pics of in the computer. I have two questions. First, has anyone here ever made a Lucy Boston Quilt, and if so can you post a picture? Other than block patterns, I can't seem to be able to find any info. about this quilt pattern. You might try using the alternative name for this quilt, Patchwork of the Crosses, or POTC. There is a plethora of eye candy out there if you look at both Pinterest and Google images. What kind of information are you looking for? 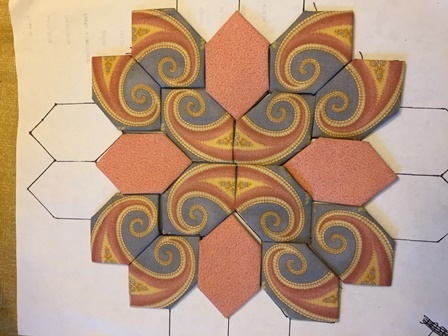 The pattern is designed for and works best with English paper piecing, so if that's what you need help with, there are lots of tutorials on the internet.